2013 was my 6th Essen trip, and after last year I felt I was getting it down to a fine art. Mostly everything went well this year as well, except that after moving house last month and my job handing my the busiest summer of my life I've had absolutely no time to prepare. So whereas I've usually gone through the preview geeklist with a fine-tooth comb, listed 50-odd things to check out and where I can find them in the halls, and read a whole bunch of rules, this year I only had a few games scribbled down. In previous years, I've always stayed at a hotel called the Ambassador in the town centre. It's cheap, near restaurants, and table space is not a problem for evening gaming (usually because we're the only people gaming there). The downside is that it's a 10-15 minute walk from the station (uphill on the way back when carrying a suitcase full of games), it's a bit studenty, and as we're the only people there you can't scout out games easily. Last year we ended up in the Ibis hotel next to the station for most of our evening gaming, so this year we stayed there instead. It seems to become a British colony for the duration of the fair, and was certainly a much livelier atmosphere! - It was easier and quicker to get from one end to the other as there were fewer bottlenecks, especially if you used the outside areas tom move between halls. - The stand numbering seemed a bit more logical than in previous years, so once you knew where you wanted to go it was generally a little easier to figure out where that was. - There were less quiet corners (hall 4 or 7 could be a bit like that in the past I recall) and the whole thing felt more open. - On the flip side, I found it really difficult to get demos of the games I wanted this year. I chatted with a couple of people about this, and we wondered if the layout contributed by making the window of opportunity for spotting a free table that much smaller. Maybe there were just fewer tables this year? Anyway, the first demo I managed to get was of Francis Drake on the Thursday morning. This is a beautiful (arguably overproduced) game with a huge board. We played a short 3 player game of one expedition (you undertake three in the full version). 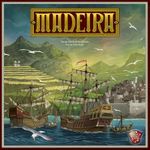 Each expedition consists of two phases: worker placement to equip your ship, and priority disks for the order of sailing in what effectively amounts to an auction mechanic to sail around the Caribbean, where you pay the various cubes you've accumulated to attack various Spanish positions. I enjoyed it a lot, and bought a copy. Player interaction is reasonable, for a Euro, and mostly through blocking. The various phases of the game are interesting and work well together. Components are top notch too. My only concern (having played a 5 player game since) is that the replayability may not be there. Each game is 3 similar expeditions, there's no real carry forward from one to another except for points and turn order, and I worry that each game may start to feel very familiar very quickly. That said, still looking forward to playing this again. Terra Mystica was the mythical "one that got away" for me at Essen 2012, sold out by the time I got to the stand. I picked up a copy last March and have been playing it as often as possible since. I really enjoy this game. Naturally, that led me to the Z-Man stand to pick up the town tiles promo. There are 2 pairs of two tiles in the set, one which pushes you up the cult tracks by 2 and one that adds shipping (or increased Fakir range). Should make for some interesting decisions, and I've popped them in to the game box for next time I play. My second demo (and second purchase) was Amerigo from Queen games. As with most Feld games, it's a mix of different elements - there's some movement, set collection, tile laying, resource management... oh, and of course, the cube tower. I thought it worked well - every turn, you throw a different colour of cubes in the top. Some will stop on the ledges in the tower, some cubes in the tower will be knocked off. The colour of cubes that come out the bottom determine what types of action will be available during the turn and how many actions may be taken in total. Add in a modular board and I think the replayability should be good as each game will throw up different choices. It looks good on the table as well. I'd say it's a medium weight game and one I'd be willing to risk with occasional gamers, whilst still having enough to keep it more interesting for a heavier euro player. This was the first of the promo buildings I picked up, for 5 euros each, from Queen. Whilst I have no issue with paying 5 euros for a promo, producing three and charging 15 euros for the lot felt a bit cynical and I walked away with the feeling I'd been had. Not an unfamiliar feeling when buying from Queen in Essen, but i suppose I keep validating their approach by buying these small add-ons each year. Sigh. 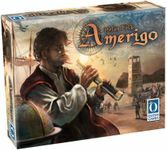 The second Amerigo Promo - I think the reason I picked up all three is twofold - part shameless completism, and part that I think having more than 16 tiles (the amount in the game and the amount required for a 4-player game) will really help the variety in the game. 3rd Promo. What a sucker I am. I got Keyflower for my Birthday in July, and decided against picking up the Farmers expansion as I think there's a lot of gameplay still to come out the base game. I also passed on the other promos available from the magazines elsewhere in hall 3, but I did pick up a copy of Key Celeste for three Euros. No idea how it plays jet, but I may seed it in to the tiles next time I play to make sure it gets used. 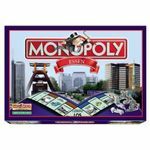 This was definitely on my radar when I arrived at Essen, but in the end I decided not to get it, certainly until there's been some more feedback on how it affects the base game (which I quite enjoy). I think this is because the two things that the expansion does are things I don't trust expansions to do consistently well. It adds tiles that each player has to determine their tribe, which makes the game asymmetrical. Not a bad thing per se, but it can break the tension in a game and sometimes lead to balance problems. An example being the Builders expansion for Age of Empires last year, which fell flat with our group despite this being our most played game. Adding a 5th player is good in theory, but until I've played with the expansion it's hard to say if it will work well or be too much of a compromise. Hopefully my fears are ill-founded, and I'm looking forward to a game of expanded Tzolkin, but I want to play it first before buying. Last stop of the day was at the 2F stand for the annual Power Grid map, which this year was India and Australia. I'm assuming that these are coming out in rough order of what percentage of Power Grid sales are in each country (we got the UK map last year). No English copies left when I got there, so I'll be printing out the rules for this one after picking up a German copy. I also picked up this year's promo card for a 1-euro donation. I've put it in the box with all the other promo cards that never get used. After a long day of traveling on Wednesday, and staying up a little too late playing Francis Drake on Thursday, I was in a bit of a daze on Friday and wandered round oblivious to the world for most of the morning before settling in to a demo of Trains around Lunchtime. To sum up trains as "Dominion with a board" is perhaps a little simplistic but conveys the general idea. It's a deckbuilding game where you're both trying to improve your deck but most of the points come from playing cards that let you put down rails and stations on the board. Stations score for all players who have a presence in a city, and it's more expensive to build rails where someone else is already, so there's a strong spatial and tactical element to managing the map. For the vetran deckbuilding player, it's notable that in the few games I've played so far I haven't seen any cards that let you remove the bulk of cards from your deck, so there may be no "chapel deck" approach as in Dominion. It's the first deckbuilder I've played in a while that's intrigued me and it did feel like a breath of fresh air in the genre. I bought a copy, although I didn't feel minded to use the ridiculously oversized shoulder bag that AEG gave me! Despite last year's addition of intruders via "Another Big Expansion" not really flying with my group, I'm still very fond of this game and new ship boards can only mean new and better opportunities for glorious failure. One of my few auto-buys of the trip and I'm looking forward to that next meteor shower already! Asmodee were giving away the fixed tiles for Myrmes at their booth, so I picked them up for a friend who has a copy. They were free, which was nice. This might be a good a game, it might not. I just don't know. I played a demo for an hour on Friday afternoon which left me with no real understanding of how the game played. And I'm going to have a bit of a rant now, for which I apologise in advance. The approach of the chap demoing the game was to have us play through each phase over several turns, explaining what happened as it happened, but never giving us any indication of either what was coming up or whether we might be setting ourselves up for a fall. Case in point was that one of my fellow players bought supplies before being told he didn't have capacity to store them. Another player shipped some supplies before finding out that this left him with a maintenance payment he couldn't meet so he had to discard them all. I felt lost the entire way through, and I don't think any of us bought the game. I think the person running the demo did the game no favours by providing no context for any of the actions we were taking. Some of the other people I know who attended the show this year also came away with the impression that overall the level of rules explanation at demo tables was a little worse than previous years. Obviously, that's a small sample of the overall con relating only to the tables we were at, but does anyone else have any thoughts on this? He liked euros, this one he had seen. It was long, 4-player, it was lean. Even though you know nothing it will be alright. ...so I bought some Madeira, m'dear. This was my last purchase of the day, made with an itchy trigger-finger having bought little over the day so far. I saw several games of it running in the hotel in the evenings and made a point of asking what people thought to try and reassure myself that I'd bought a good'un. All good feedback so far so I'm looking forward to getting this one to the table in the next few weeks. This was the game we played, almost to the correct rules (at least by the end of the game...) on Friday evening. Now, I've owned a copy of Through the ages for about 5 years, but I'm ashamed to say I've never played it. This felt quicker and more accessible than my abortive attempts at TtA. It's a civ-building game with a similar central conceit, although I will leave the detailed comparison to others. From what I can glean so far the key differences are a shorter play time and less targeted military actions (although these are still important). Of the five of us who played, four enjoyed it and one wasn't convinced. I was one of the four, although I'm not convinced by the five-player game. The main modification is that one should read all cards that refer to the top player or bottom player as the top two or bottom two. We struggled with this, although starting play at 11:30pm after 2 days of Essen may be a contributory factor here! I picked up a copy as my first purchase of Saturday, having checked a couple of rules questions first. whilst I was there, I did feel sorry for one guy on the Asmodee demo tables, who identified himself as one of the designers. You could tell he was getting a little annoyed with all the questions asking him how it was different to Through the Ages! Next stop was a brief, two-player demo of Shadows over the Empire, which I'd seen in a fair few bags as I'd been walking around. 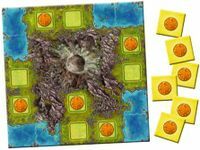 It's a little hard to describe - "an area control game where the win condition is to get all your pieces on to the board in uncontested areas", is perhaps the closest I can get. Each area is a card representing a character - there are a lot of these in the box so the game should be different every time. I found the card a little difficult to read when upside down and across the table from them, and the whole style of the game a little busy. The gameplay was also a bit chaotic for my tastes. I'm pretty sure it's one of those games that opens up to you once you know all the cards and can recognise them from the art, but I decided to pass on this one. There were a whole bunch of Snowdonia promos and mini expansions available at Essen. I got the base game last year, I've played it about 10 times since then and I really like the design. That said, I decided to pick up just this one as it was available from the Surprised Stare booth. The rest were from a variety of different publishers spread throughout Spiel and I didn't really fancy trekking round to pick them all up. This one is probably enough for now - I can always add others later. Concordia was another game I couldn't get a demo of. I did get close but was cut out by a young lady with some excellent positional work with a pushchair, and I decided not to argue. I've got a couple of the designer's other games. I like Navegador, but I'm less fond of Imperial. I decided to gamble after listening in to a rules explanation, and played a game of it on the Saturday evening. It's probably easiest to describe in terms of what it reminded me of. The cards ( which are standing in as the action selection mechanic instead of Mac's good ol'rondels) are acquired in a similar way to stone age and have an in game effect and a scoring multiplier. There's some route building which is nothing like but looks visually similar to Thurn and Taxis. It's a mix of different things but I felt it worked well as a whole. 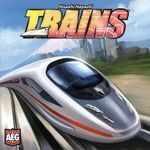 First impressions are that some of the scoring methods may be much stronger than others, but the game is on the lighter end of the spectrum and might be a good game to play with someone you're trying to interest in more mediumweight games after they've mastered Ticket to Ride. In to the home straight, and I picked up a cheap copy of Castles of Burgundy. 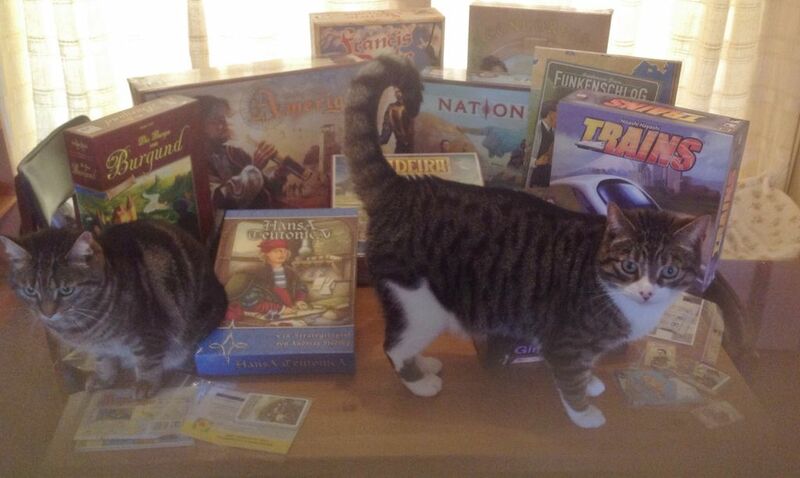 I've played three Feld games previously. Trajan and Amerigo I liked a lot, Notre Dame left me cold. As this is so highly regarded on the geek I decided to take the punt. It's the German edition, but I was very pleased to discover that it had a copy of the English rules in it. Looking forward to learning and playing. Incidentally, the German title for this is "Die Burgen von Burgundy"... which made me go and look for (and fail to find) a photoshop of the cover to the well-regarded Anchorman varient "Die Burgen Ron Burgundy". One the way to the exit, I decided to queue up for the (I think this is right) Heidelberger Spieleverlag discount booth, which I've always looked round in previous years but had been beset by epic queues all con. I remember Ginkopolis from last year, and they had it going cheaply so in to the bag it went. I'd been hoping to find one or two lighter games on the trip and this looks like it might fit the bill. German version, no English instructions however so I've had to print them off at home. ...going for 10 euros, which in my opinion is an absolute steal. I've played it several times but never got my own copy. This gave me a nicely full bag to head to the exit with!